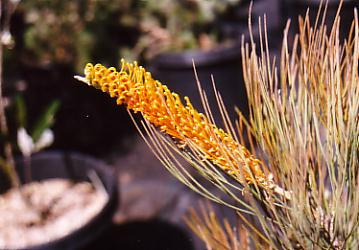 Highy ornamental in flower. Medium shrub for arid areas. Masses of large, bright yellow flowers appearing over a long period, mainly in spring and summer. Needs well-drained sandy soils in full sun. Prefers a hot dry climate. Prune for bushier growth, reshoots from rootstock. Great bird attractor. Difficult to propagate as seed is variable.